Hours: Monday – Sunday 11 a.m – 9 p.m. 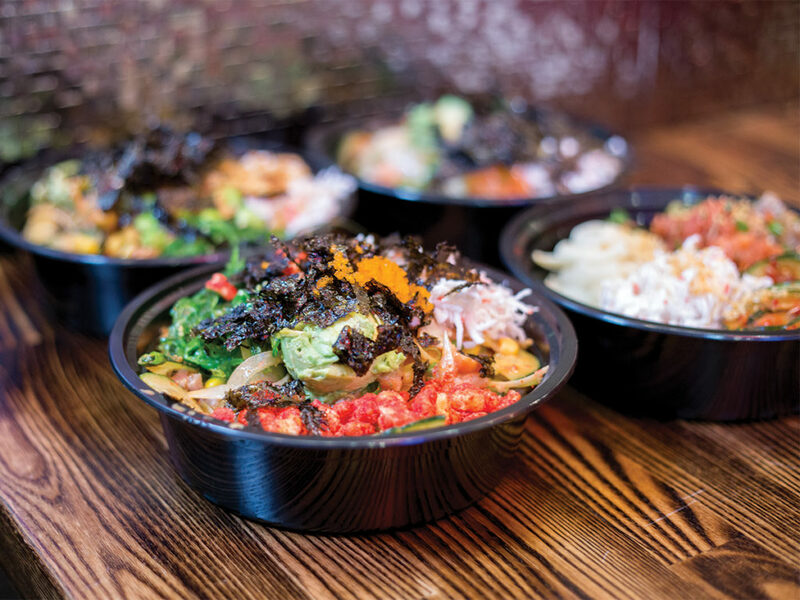 Located conveniently just a few blocks from UCR at the University Village, the primarily California-based chain Poke Bar opened a little over a year ago. This Hawaiian poke restaurant is a nice addition to the multitude of other Asian-style restaurants with its affordable prices, great food and relaxing atmosphere. The bar creates a laid-back environment and is certainly a place that I would go to hang out with my friends and family. It’s ambience is modern and casual, and if the lights were turned down and the music turned up higher, it could pass as a nightclub. The small space makes it feel intimate as you enjoy a fresh poke bowl and talk about the day. One could easily notice the vast array of people this restaurant appeals to — from average college students going out for an early evening snack to a large family coming in for a dinner together. Coupled with the helpful and conversive employees behind the counter and the vast array of fish and toppings available at your fingertips, it is no wonder why this restaurant appeals to such a wide demographic. It’s ambience is modern and casual, and if the lights were turned down and the music turned up higher, it could pass as a nightclub. When you first enter, you’re greeted by a bar and a variety of fish to choose from including albacore, spicy salmon and regular salmon, all of which are situated on a bed of rice. You then select different vegetables and toppings for your bowl including onions, seaweed, crab meat and several others that can be, admittedly, a little overwhelming. It also helps that when you get to the worst part, paying, it doesn’t break the bank with the cost being a mere 10 dollars for a bowl. The food we ordered was just as good as the experience itself. If you’re a person who loves spicy foods like I do, you’re in luck. I ordered spicy salmon, spicy tuna and albacore on a bed of white rice. Along with that, I had Poke Bar’s house sauce on top of ginger, crab meat, green onions and crispy onions. The spice, however, doesn’t come out as much with there being a montage of other flavors but it gives it an added kick to the variety of other tastes and textures within the bowl. One major aspect that makes Poke Bar unique is the option of having crushed up Flamin’ Hot Cheetos sprinkled on top. If a variety of spicy fish isn’t enough for you, I would definitely suggest the Hot Cheetos to give it that final kick. This worked fabulously with another bowl I had with seaweed, avocado and tuna. It sounds like an interesting combination, and if you’re an avocado-lover, this is the bowl for you. The avocado can be a little overpowering but it certainly wouldn’t be an issue if you’re a fan of it (unlike me!). Poke Bar is definitely a place where you can go to unwind, eat some great food and chill with some friends. The atmosphere is welcoming to everyone and it’s instantly felt as you walk through the door. I highly recommend this for anyone who is looking for a new place that’s both fun and delicious. With all that said, Poke Bar is definitely a catch for our community.